This is my attempt to arrange the ideas. Here are the progressions found in Appendix E of the standards. I do digress into talk of matter and substance when it supports later understanding of atoms. I’ve expanded these to list ideas explicitly and separately. (Grades 9-12) Light spectra from stars are used to determine their characteristics, processes, and lifecycles. Solar activity creates the elements through nuclear fusion. The development of technologies has provided the astronomical data that provide the empirical evidence for the Big Bang theory. Excited atoms/molecules emit light of particular frequencies and wavelengths (collectively called the emission spectrum of an atom/molecule). The frequencies and wavelengths of light emitted by atoms/molecules depend on the structure of the atom/molecules. Atoms/molecules absorb light at particular frequencies and wavelengths (collectively called the absorption spectrum of an atom/molecule). (Grades K-2) Matter exists as different substances that have observable different properties. Different properties are suited to different purposes. Objects can be built up from smaller parts. Matter can be made of different substances. Substances have many properties, each with their own uses. Objects are made of smaller parts. (Grades 3-5) Because matter exists as particles that are too small to see, matter is always conserved even if it seems to disappear. Measurements of a variety of observable properties can be used to identify particular materials. Indivisible particles of matter are too small to see. Measurements of properties characterize substances. (Grades 6-8) The fact that matter is composed of atoms and molecules can be used to explain the properties of substances, diversity of materials, states of matter, phase changes, and conservation of matter. Molecules are made of atoms. Matter is made of atoms and molecules. Different atoms and molecules explain different substances. Atoms and molecules behave differently in different states of matter. Atoms and molecules change their qualitative behavior at phase transitions. Matter is conserved because atoms are not destroyed in physical and chemical processes. (Grades 9-12) The sub-atomic structural model and interactions between electric charges at the atomic scale can be used to explain the structure and interactions of matter, including chemical reactions and nuclear processes. Repeating patterns of the periodic table reflect patterns of outer electrons. A stable molecule has less energy than the same set of atoms separated; one must provide at least this energy to take the molecule apart. An individual atom has structure explained by electromagnetic and nuclear interactions. Energy is required to remove electrons from an atom. Energy is required to break molecular bonds. (Grades K-2) Heating and cooling substances cause changes that are sometimes reversible and sometimes not. (Grades 3-5) Chemical reactions that occur when substances are mixed can be identified by the emergence of substances with different properties; the total mass remains the same. Mass is conserved in chemical reactions. Measurement of properties of substances identifies when chemical reactions have taken place. (Grades 6-8) Reacting substances rearrange to form different molecules, but the number of atoms is conserved. Some reactions release energy and others absorb energy. Chemical reactions result in different molecular arrangements of atoms. (Grades 9-12) Chemical processes are understood in terms of collisions of molecules, rearrangement of atoms, and changes in energy as determined by properties of elements involved. Chemical reactions occur when molecules collide and atoms rearrange. Changes in energy during a chemical reaction depend on properties of the atoms involved. Let me know if you think I’ve forgotten anything here! The AAAS has a great website under the auspices of Project 2061 that lists ideas and misconceptions related to Atoms, Molecules, and States of Matter. Bright line spectra of gases. This requires understanding of how accelerated charged particles can emit light, how charged particles can absorb light. It should include the Balmer-Rydberg formulae for hydrogen. Size of atoms (electron cloud and nuclear). Evidence from multiple sources. How should this knowledge be arranged? TODO: I’d like to work on a Learning Landscape, Knowledge Packet, or Learning Progression synthesizing these sources, but that will have to be added later. Needed to explain phases of matter. Needed to explain chemical reactions in integer ratios. Needed to explain static electricity. Needed to explain the Geiger-Marsden gold foil experiments. Needed to explain why electrons don’t fall into the nucleus after radiating EM waves. Needed to explain the Rydberg formula. Needed to explain spectral splittings (fine, although this could be done with Klein-Gordan equation and is really a hack onto the non-relativisticSchrödinger equation, and hyperfine) Note: I need to go back to my QM books on this one. About the biggest controversy is disagreement over the need to teach pseudo-historically these models. This is leaving out all the really bad ones. 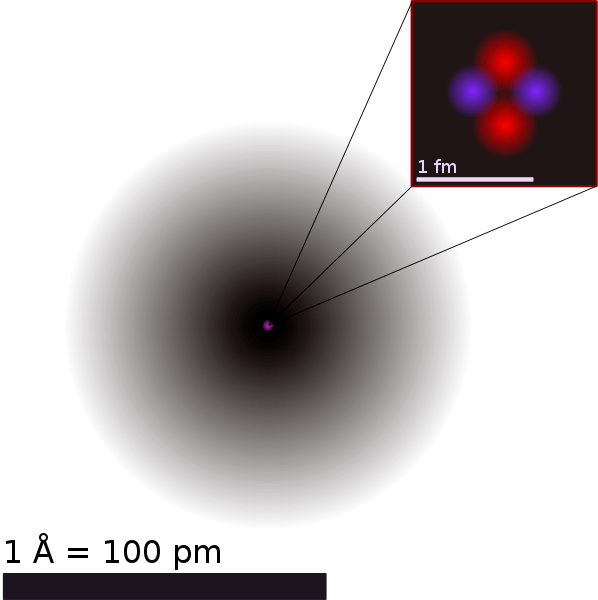 However, the terrible picture that society has adopted as the meme for atom (see below) affects student perceptions of the atom. Stylised Lithium Atom by Indolences, Rainer Klute on Wikimedia Commons. Note that this is only a model, based loosely on the Bohr model. Also, these 3 electrons couldn’t all occupy the same circular orbit. It would be nicer if students came into classrooms with the following conception of an atom. Helium Atom QM by Yzmo from Wikimedia Commons. This is a much better rendition of the electron cloud but might be as bad for the nucleus. However, it is nice that it shows scale. Physics teachers tend to like the Bohr model in that it can quickly (although magically) explain the Rydberg formula. However, there are many reasons to dislike the Bohr model. TODO: What classroom experiments or simulations could help students to progress in their knowledge of atoms?